Festival calls for celebrations and not to mention the mega one Deepavali, looked forward to, by one and all in Tamil Nadu. Tahiti Events, an Event Management company now brings you South India’s biggest Dance Championship with the target audience of young College students, Corporates, and all other youngsters with a flair for dancing from different states. Also among the chief guests and judges would be celebrities and young actors from South India. Winner prize money being 1 lakh. We have a lot of young participants crowding for this event. An added advantage is the location. 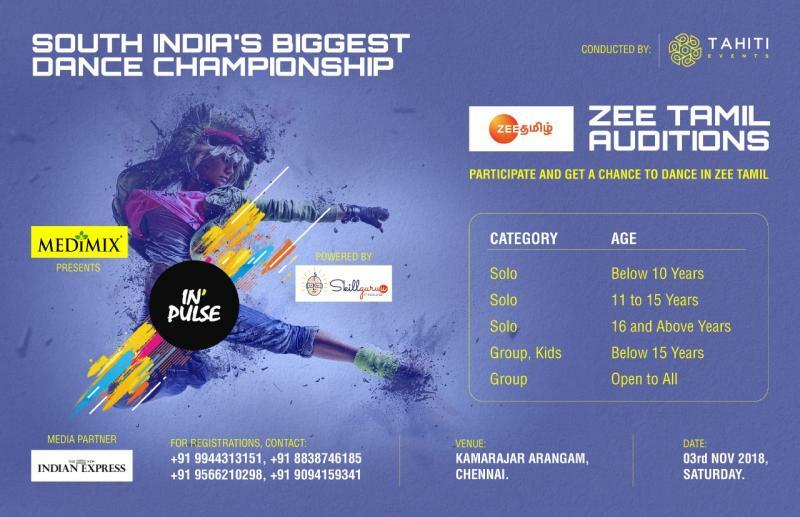 The Dance Championship is conducted at the centrally located prime area of Teynampet, Kamarajar Arangam on 3rd November 2018, Saturday between 9:30 am and 10 pm. The New Indian Express has joined us as a Media partner, Zee Tamizh is on board as our Channel partner and IndiaGlitz as our online partner. Send ur contact no…and how will participate this kids dance event..